In the South Kensington neighborhood of Philadelphia, you can almost always hear the distant rumble of trains. The Southeastern Pennsylvania Transportation Authority (SEPTA) runs on an elevated track along North Front Street, one of the area’s main thoroughfares; on its way uptown and downtown, it passes right below the third-story windows of Teach For America’s Greater Philadelphia chapter, in the century-old Oxford Mills complex. The 25 Teach For America staff members who occupy the space seem to be unfazed by the rattle of the public transit system just a stone’s throw from their desks. Sarah May, the education nonprofit’s managing director of development, is showing me around the office in the east building of Oxford Mills. Exposed-brick walls, visible ductwork, and wood-beam ceilings enclose the space, which is illuminated by light from industrial-style, metal-framed windows. “It doesn’t feel like an office,” May tells me, gesturing toward the bookshelves filled with resources for teachers and students, and the foosball table in the corner. “It’s a fun place to come to work.” Framed snapshots line the desks, and the low hum of conversation puts me at ease. 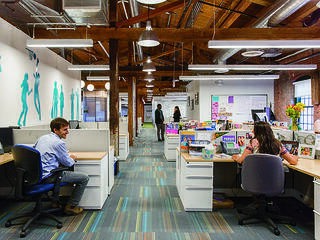 Teach For America is just one of 12 nonprofits that have found an ideal home in this pair of former industrial buildings. Gabe Canuso and his business partner, Greg Hill, of Philadelphia-based D3 Real Estate Developers, knew they wanted to create a community that would boost the area’s public school systems. They envisioned the complex before ever laying eyes on the structures that now make up Oxford Mills. “This was absolutely our first choice,” Canuso says, explaining that he and Hill considered about 15 different properties that could accommodate apartments for teachers and offices for education nonprofits before settling on this one. “You have two buildings, two primary uses, and for the most part, it divided up nicely.” The two structures are separated by a cobblestoned section of Hope Street, a north-south road that runs through the rest of the city. The complex’s west building holds 94 below-market-rate apartments, designed to foster a community of education-minded tenants who would understand the unique challenges of working in a beleaguered public school system. Ideally, Canuso and Hill thought, the two buildings would create a symbiotic environment where residents and employees could support and inspire one another. “Our goal was to bring people together and encourage people to maybe cross-pollinate from one organization to the other,” Canuso says. Claiborne Taylor and Suzie Eliscu chat in Teach For America's Oxford Mills office. Hope Street (foreground) divides the east and west buildings at Oxford Mills. Over more than a century, the two masonry buildings on West Oxford Street have been at the center of change in South Kensington. 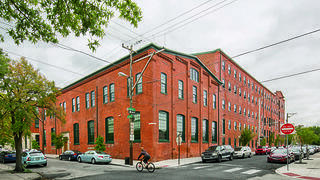 Originally built as the headquarters of the Quaker City Dye Works between 1873 and 1913, the structures housed one of the biggest employers in the larger Kensington neighborhood at the turn of the century. The firm manufactured dye, cotton and woolen yarns, and silk, gradually expanding to employ 200 workers at its peak. More recently, starting in the 1970s, the former dye-works complex housed the Pieri Creations lamp factory. As the lamp industry moved overseas and business dwindled, however, the 175,000 square feet of space became less and less necessary. By the time Canuso and Hill scouted the property in 2011, the lamp factory had only one employee left, and the evidence of years of deferred maintenance was everywhere. The last employee standing was Richard Revere, who had been working at the lamp factory since the early 1990s. In their determination to seamlessly meld the old with the new in the process of building Oxford Mills, Hill and Canuso hired Revere to conduct routine maintenance and repair for the two buildings once their rehabilitation was complete, a role he has wholeheartedly embraced. He’s currently training to be an in-house technician at the complex. As Canuso walks me through the halls of the west building, explaining the particular challenges of adapting a sprawling industrial structure that was built in multiple stages, I’m struck by a myriad of carefully preserved details. Original fire doors are decoratively mounted in intervals along the hallways, and an edge of the original masonry foundation—another intentional reminder of the building’s history—juts out from underneath a wall in the fitness center. Collaborating with BartonPartners, an architecture firm with a track record of preserving buildings in the area, historical consultants Powers & Company referred to early renderings and documents the city had on file. This information led them to repoint brickwork on both buildings, brace and add support to the existing roofs, and install new metal windows that looked similar to the originals. “We are very modern in our approach, but we’re thoughtful about the history of the city that we live in,” says Canuso, who grew up in nearby Cherry Hill, New Jersey. “We would much rather work with an existing building than tear something down and build something new.” Hill (whose connection to the city began when he attended Temple University) and Canuso also designed and constructed the project to achieve a green building certification from Enterprise Green Communities, an initiative of the housing nonprofit Enterprise Community Partners. They preserved the building’s original materials, such as hardwood floors, in as many places as they could, and used sustainably sourced and manufactured materials for brick infill and roof repairs. D3 collaborated on the project with Seawall Development, which had developed two similarly education-focused communities in Baltimore. The team used federal historic tax credits for the $37.8 million project, and $9 million of the total cost was financed through the National Trust Community Investment Corporation (a for-profit subsidiary of the National Trust) using New Markets Tax Credits. Hill estimates that teachers live in about 60 percent of the units, while the remainder of the one- and two-bedroom apartments are rented to tenants making comparable salaries. Because they used tax credits, Hill and Canuso could finance the project with a lower debt-service requirement, and in turn pass those savings along to Oxford Mills tenants. Currently, a one-bedroom apartment in the building goes for about $1,300 a month, and teachers receive a discount of between $200 and $400, depending on the unit. Rodolfo Coplin has lived at Oxford Mills since 2016, and two years before that he worked in the east building as a Teach For America corps member. Now an assistant principal of operations at Woodrow Wilson High School in nearby Camden, New Jersey, the 24-year-old says he loves the easy sense of community that he encountered when he moved into his one-bedroom apartment. It has concrete floors and high ceilings, and it overlooks a central courtyard scattered with circles of chairs surrounding fire pits. In the evening, his windows are illuminated by the glow from strings of hanging lights that zigzag across the courtyard. “Many of the people here are young,” he says. “It’s communal.” He adds that the building’s management hosts happy hours and provides breakfast at the start of each new semester, encouraging tenants to bond. Because of the challenging nature of the area’s public school systems, preventing teacher burnout is a big concern. For the past decade, Philadelphia schools have consistently graduated students at a rate below the national average, and 81 percent of students are economically disadvantaged enough to qualify for free or reduced-price lunch. Sarah May, of Teach For America, says that the district has been in financial crisis for several years. That makes support and resources for teachers all the more essential. The more time I spend with the people at Oxford Mills, the clearer it becomes that this sense of camaraderie and communal support is something the educators who live and work here will bring to their interactions with their students as well. 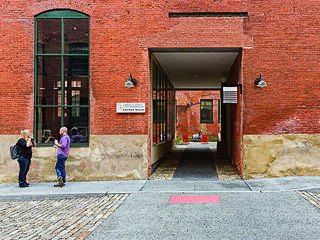 The complex won a 2015 award from the Preservation Alliance for Greater Philadelphia. 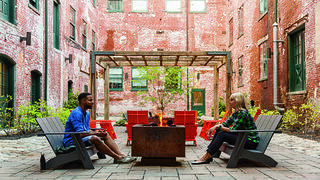 Rodolfo Coplin and Kelly Anderson, both Oxford Mills residents, in one of the complex’s two courtyards. Things are changing quickly on the blocks surrounding Oxford Mills. “Gentrification is a hot-button issue everywhere, but especially in Philly,” says Kelly Anderson, who works in the City of Philadelphia’s water department and has lived in a one-bedroom apartment in the complex since 2014. “But I think that [D3] has done a nice job integrating the newness with the oldness in Kensington.” She notes that neighborhood civic groups such as the South Kensington Community Partners frequently use the building’s common areas for meetings and gatherings, and emphasizes that D3 and Seawall have made every effort to work with the neighbors in the community. D3 is also turning over several new projects in adjacent Fishtown and Northern Liberties, with a focus on preservation and adaptive reuse. Memphis Flats, a new apartment, condo, and office development, is housed in a 1920s-era baseball factory. The headquarters of Honeygrow, a Philadelphia-based fast-casual restaurant chain, occupy a repurposed warehouse. Amid it all, Canuso and Hill have remained careful not to meddle too much with the fabric of the existing neighborhood. 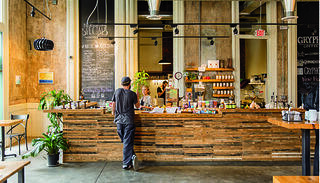 The by-now-familiar touchstones of exposed-brick walls and ductwork are repeated in the east building’s Gryphon Coffee Co., a new neighborhood mainstay offering locally sourced, seasonal dishes and artisanal coffee. When I ask chef and manager Jeff Carr what his favorite part of working in the space is, he says, without hesitation, “The light. I really enjoy being in a place with such huge windows.” They stretch up toward the high ceilings, streaming light into the space just as they did more than a century ago, when it likely served as a showroom for the fabric and yarn manufactured at Quaker City Dye Works. In thinking about how Hill and Canuso took the dye-works building and made it useful again, I’m reminded of a detail in a conference room that Canuso showed me on the ground floor of the west building. Behind a bank of tables and chairs stands a cast iron, load-bearing column with a brick-and-concrete base. It looks out of place in the carpeted, fluorescent-lit room; it’s clearly a piece out of time, a holdover from another era. When I point it out, Canuso gets excited. Hill and Canuso believe that without their intervention and without the possibilities for rehabilitation afforded by historic tax credits, the complex would have continued to languish, and an essential stitch in the historic fabric of South Kensington might eventually have been irretrievably lost. Today, they’re watching it live up to the potential they sensed underneath the leaky roof and the Philadelphia trees, waiting to be recognized.